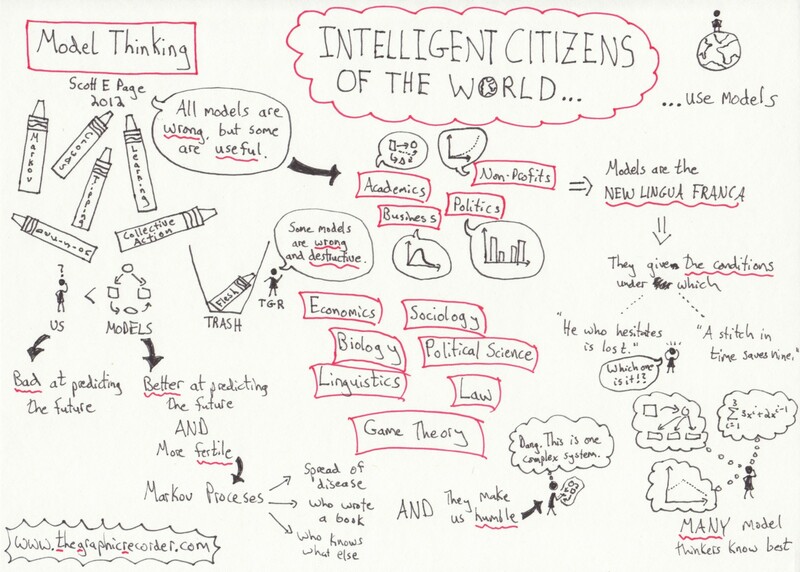 In his second video lecture of the course, Page takes a global approach by explaining how models help you to be a more intelligent citizen of the world. As he points out, models are used in a wide variety of fields, many of which are listed in the sketch above. With a global perspective in mind, I would like to add an important field that was left off of the list: environmental science. If we are going to take a global approach, then we would be remiss to leave out models of climate change. I hope that those models are addressed at some point in this course. I also found interesting the emphasis on the point that models are wrong. As Page points out, models are incomplete abstractions of complex systems. But as more and more evidence is gathered, those models are refined and can become more useful. That is really what science is all about – comparing new data to the model that already exists, and then seeing what adjustments need to be made to that model. In some cases, the model will have to be ditched entirely (case in point: the Earth-centered model of the solar system). By keeping in mind that models are inherently flawed, it might make it easier to recognize when it is time to tweak the model, and when it is time to throw it out entirely. If I get the chance, I’m going to try to revisit Kuhn’s The Structure of Scientific Revolutions throughout this course on model thinking. That book served as the cornerstone of a Science Methods course that I took while getting my teaching degree. It takes an in-depth philosophical look at the process by which scientific revolutions occur. A scientific revolution is essentially a rejection of an old model and adoption of a new one, which is why I think that book and this course might complement each other well.